Basic and Advanced Tutorials about lighting. Some basic example tutorials about geometry, architecture. But nevertheless looking in other maps how architecture was done can not hurt. If you have games like UT2004 installed you could browse the static mesh packages. 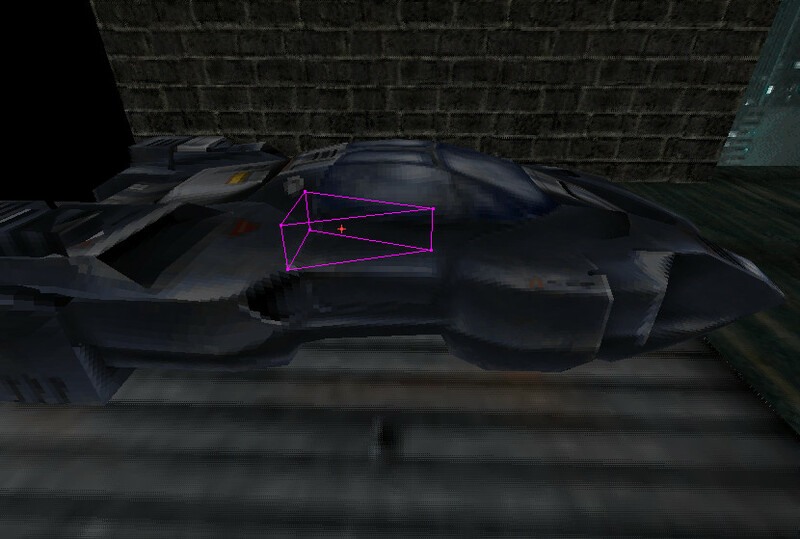 Sometimes several static meshes can give you ideas what details you can build in your levels to let it look nicer. If you have some good tutorials - either for mapping for special gametypes or other general mapping tutorials you can pm the staff the links. We will check them and maybe add them to the list here. A huge collection of various tutorials regarding almost every UnrealED related topic. Definitely a must have for any beginner/novice mapper and it has helped me a lot. papercoffee wrote: http://www.moddb.com/groups/unreal-cant-die/news/lodes-unreal-ed-back-online/#2065802I think they are pretty useful. Leo(T.C.K.) wrote: Blast from the past. Note that this is pre UnrealED 2.0. You can import them into MyLevel. 7. now set each surface to UNLIT. 11. next, study the skybox images (either with eyes or photoshop) and find the complimentary hue/sat value. What I mean here, is there is a color that matches nicely with the colors in the pallette of the skybox "set"
For those winter mountains, or tyically dusk time of day, greyLight is the best place to start. That is 160hue 150sat. If closer to brighter daylight, increase saturation to 160+ etc etc. Add a few regular lights into the map (color them if you like, but keep the radius small and put them nearer the ground - say 128 uu or so with a radius of 25. rebuild. 13. observe how the light casts in your map, or on other bsp objects, and how it matches the skybox..
14. play with the ambient settings as you add lights to your map and (usually) you adjust the brightness down to around 10 or so depending on how many lights and the radii etc as you build your level. Thats basically it - you will still have the "edge of the map transition" to deal with, but there's lots of ways to create the illusion of a terrain with distance, and prevent the player from seeing the skybox from the edge of the map. I might not be able to finish it completely before I have to head off to class, but let's see how far I can get. it DOES assume you know how to move and place objects and brushes. First, you start by placing your actor. where you want it to start from. the direction of my actor. 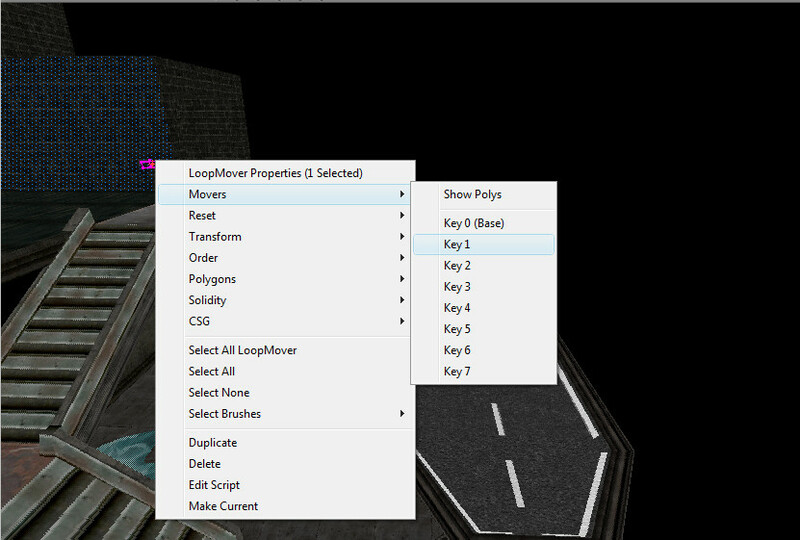 Then right click the "add mover brush" icon and select your favourite mover type from the menu. I picked "LoopMover" because I want my animation to loop without the car flying backwards on the way back. 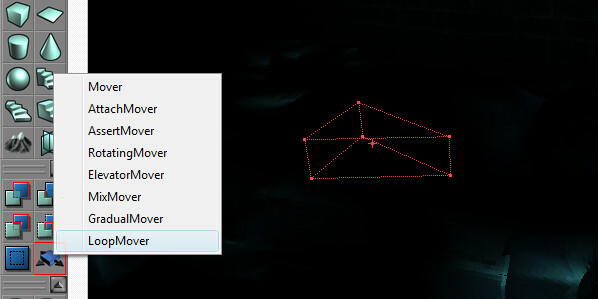 Note: If you test the map and your object shows up black or unlit, it means the 'origin' is hidden inside the mover. Try moving the mover aside a little until it changes. 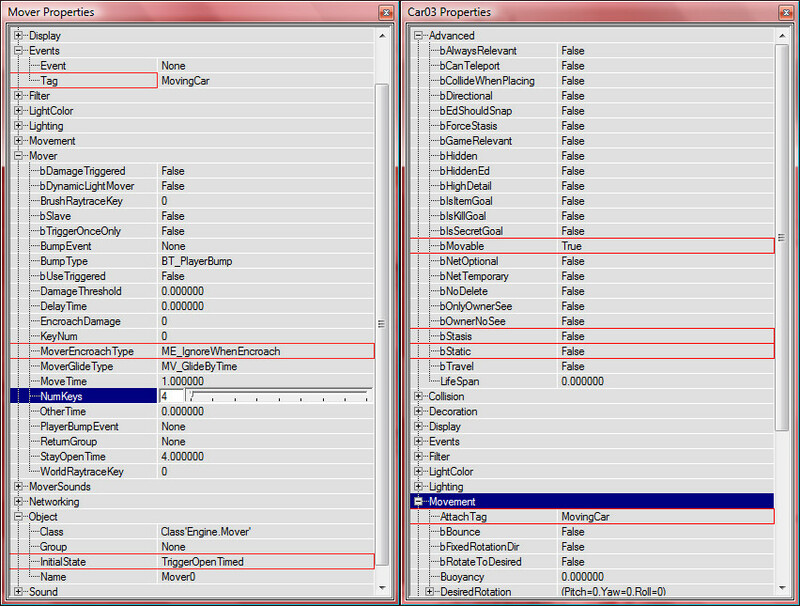 The next part will be changing the properties. As you see, I highlighted the important options in red. Start in the properties of the actor you want to move and ensure that under the +Advanced: "bMovable" is true and "bStatic" and "bStasis" are false. If you don't want your actor to become invisible online you might also want to tick "bNoDelete" to true. Finally set the AttachTag under +Movement to something easy to remember that isn't used anywhere else in the map. I named it "MovingCar"
Under +Mover you should set "MoverEncroachType" to "ME_IgnoreWhenEncroach" unless you want the actor to jump back to start if you bump into it. Numkeys and MoveTime can be altered to your own desire. MoveTime=The time (In seconds) to move from one frame to the next. As you noticed, at this point the mover really doesn't do much, but what did you expect? We haven't even told it where it has to go yet! Start by right-clicking the mover and moving to the 'mover' subcategory till it collapses. Then select "Key 1"
Now, drag the mover to where you want it to move towards, Note that it will move towards this location in a straight line. KeyPoints may be necessary, just repeat the action with Key 2, 3, etc until you used these points to set out a nice path. Don't forget rotation for a natural feel! with a normal mover it will slowly begin to retrace it's steps, moving backwards. Now comes the last part: Triggering the mover, the mover won't do anything until it is triggered and told to do it's job. (In my case "MovingCar") you can 'trigger' the mover when you, or a bot touch the trigger actor. Same setup as above, only the mover will be triggered when the monster is killed or the decoration is destroyed. 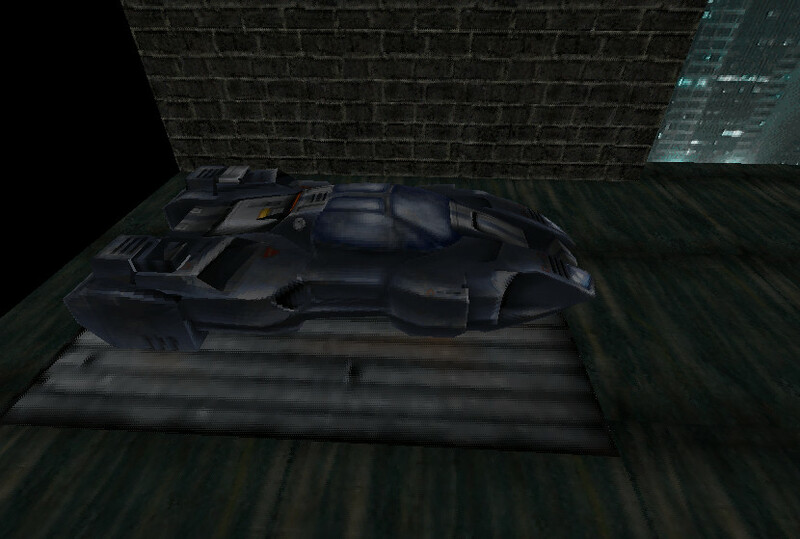 it will automatically trigger the mover one second after the first player spawns. NOT before that. This one is a lot more difficult to set up, but is also the only native trigger that will output events before the game starts. Once you placed it, go into the properties (Right click!) the first thing you have to look for is +Object and setting the InitialState to "AlwaysActive"
Then navigate to +StochasticTrigger and open +Events. As the first event enter the tag of your mover, in my case "MovingCar"
Then look down and take a look at the three options, these involve randomization, which sadly only affects the first time. 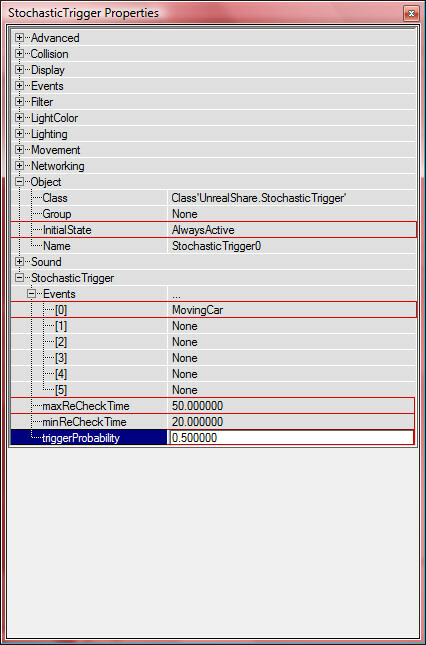 Note: In my example the trigger chooses a random time every 20 to 50 seconds to try and trigger my mover, it then has a 50% chance to do so. The last thing that remains now, is to do a full rebuild and it should work! You (Probably) made your first looped attachmover now, congratulations! Thanks to Chamberly did I remember to add this link to our List. And Thanks to Dr.Flay could we restore and add some tutorials. Also could we restore Bot40's Terrain Tutorial thanks to Hellkeeper!! I totally forgot to link to this download thread ... a bazillion of tutorials gathered by Renegade. Renegade wrote: Do I have a gift for you fine people. Recently, I took the time to download and sort through hundreds of tutorials. This package is the product of all that monotonous saving and sorting. Among the handful of novice tutorials, there's some quality in-depth articles included by respected mappers like Hourences, Gui and Mr. Prophet. I've done my best to weed out the poorly composed tutorials by noob authors. Have other good quality or hard-to-find tutorials? Link them here and I'll create an expansion pack. EDIT: Smaller file now. Removed unrelated Photoshop tutorials and added a slideshow by Carthage. Max Points supported (exhausted here as in picture with error) = 128000 - also your display will not help.